Many services exist that allow non-developers to create their own websites without too much hassle, but only a handful�cater specifically to photographers. Photographers.pro�aims to stand out by offering�an all-inclusive package for photographers that provides a website (including a custom domain address and email) for a yearly fee of $70. That flat-rate fee includes a full management interface for creating and maintaining a website, unlimited storage, and the promise that ‘no special IT knowledge’ is required. Does Photographers.pro distinguish itself from other options available to photographers? We recently took the service for a spin to find out. The Photographers.pro account�interface is simple, and provides an empty template the first time a�user logs into his or her account. Those familiar with WordPress will find the system familiar, though it is more simplistic. Because the service is all-inclusive, there’s no need to register a custom domain name elsewhere, sign up for hosting, install a CMS and themes, or perform many of the other tasks�commonly associated with website creation. Rather, the blank website template is accompanied by a single menu aggregating all of the creation and maintenance tools.�A default menu is presented, and the ‘Contact’ and ‘Newsletter’ pages specifically are already equipped with the necessary information fields for visitors to access. The user merely needs to swap the placeholder email address for his or her own email addresses. 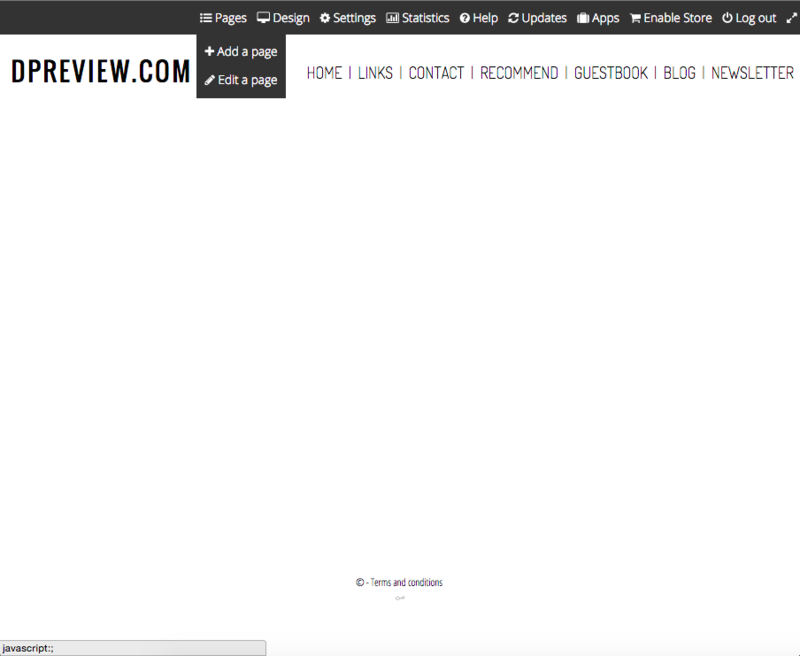 The default blank website template. 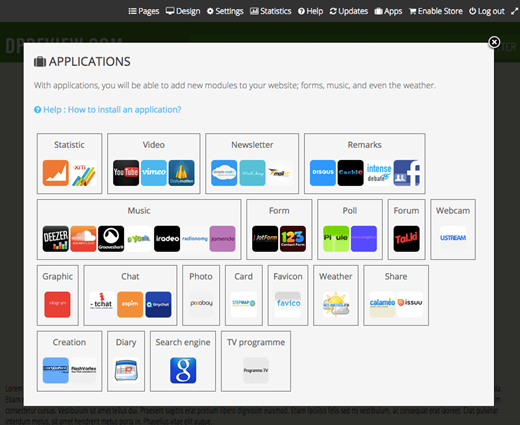 The tools are located within the menu on the top right side of the page. Hovering over an item on the menu will reveal a drop-down list with various sub-options. The first place to start is ‘Pages’, where the default pages shown on the website’s navigation menu can be disabled, edited, or added to. An option for adding another Web page is also available. 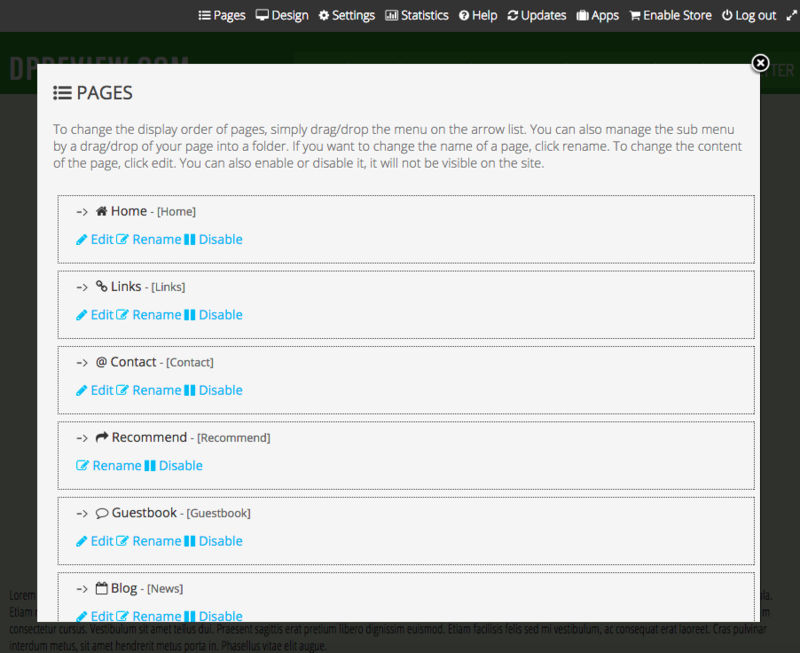 Any pages that are added will appear on the website’s navigation menu. Hovering over a menu item will reveal a drop-down list with additional menu options. Clicking ‘Edit a page’ will pull up a menu displaying each page, as well as the option to disable it, edit it, or rename it. Renaming the page will alter its label in the website’s navigation menu, while disabling it will make it disappear from the website. The pages appear in a pop-up. 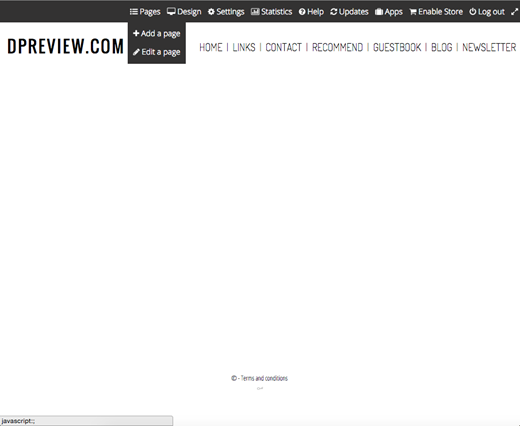 Clicking one of the three available options for a page will reveal a new pop-up with the page content tools. Hint: be sure to click ‘Send’ after uploading an image or it won’t upload. 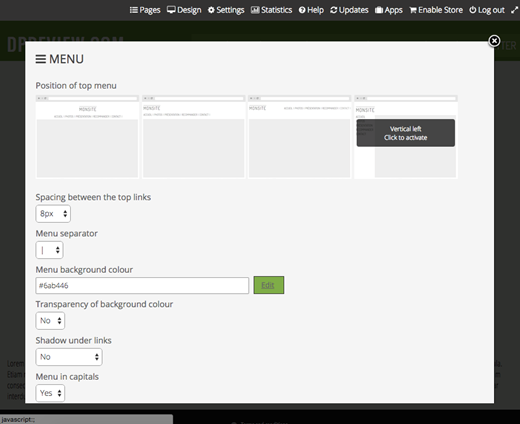 The ‘Edit’ option will open the settings for creating the page itself, in terms of content. A text field is provided for adding text, and there’s an option for uploading images to the page’s gallery. A couple simple settings are available under ‘Preferences’ on the page for choosing how the images are handled. A specific width can be selected, as well as alignment and in what way the images�will be displayed: as a slideshow, diorama, album, or as ‘free’. The text box includes similar design tools like size, alignment, and more. When changes are made to a page and then saved, the pop-up box disappears and the website is automatically refreshed to reflect the changes. 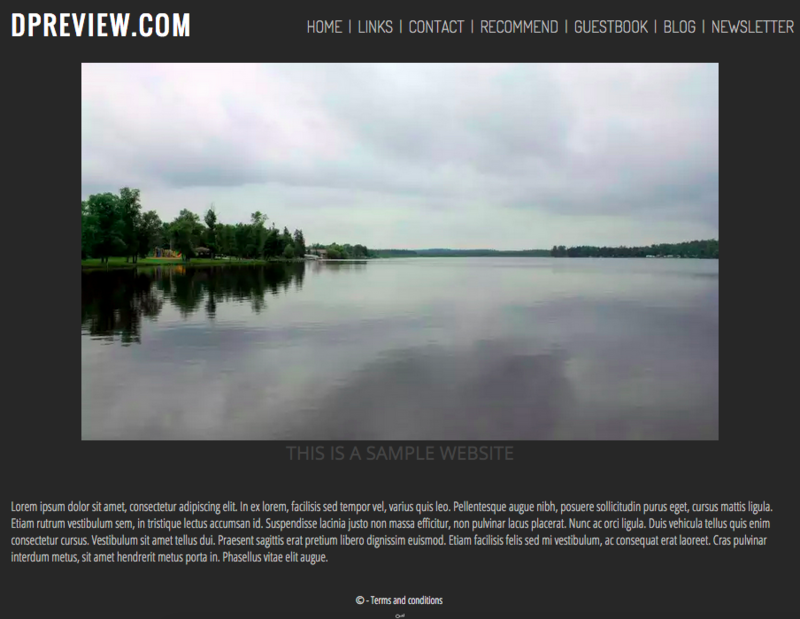 Basic changes like adding text and images results in a very simple�(but usable) photography website. The entire process to reach this point is only a few minutes. More than two dozen additional layout options are available, including things like options to display terms and conditions, an email address, telephone number, and the date, as well as different font size, background and border color, transparency, header, and frame settings. None of those options are required to be used, however if the user does not feel comfortable tweaking them, they can stay at default and the website will be entirely usable. An element of sophistication comes into play once you enter the ‘Layout’ sub-menu. This affects the colors and related design elements of the website without influencing things like font and menu orientation (those can be altered individually). A total of 12 ‘Layout’ options are offered. By scrolling lower, additional settings are provided. Users can align the site’s content to either the left or to the center of the page, and choose whether it expands 100 percent the width of the page or only 1024 pixels (from the left). 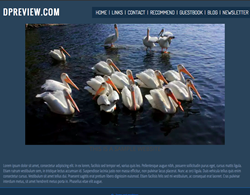 By tweaking some of those settings, users are able to quickly change the style of the website. The extensive options provide a great deal of control over how the website is presented, and so despite having an easy-to-use interface, the resulting website can display a relatively unique design that is distinguished from other websites created using the service. The level of design detail, however, will depend on how thoroughly the user digs into the different settings that are offered. The same type of settings menu is provided for changing the website’s navigational menu. Each menu box offers a different menu orientation, such as left-side alignment or a vertical alignment.�Farther down on the page, additional settings are offered for tweaking the menu, including options for adjusting its background color, whether the letters are capitalized or not, the menu�s size, spacing, font style, mouseover colors and decorations, and default link colors. 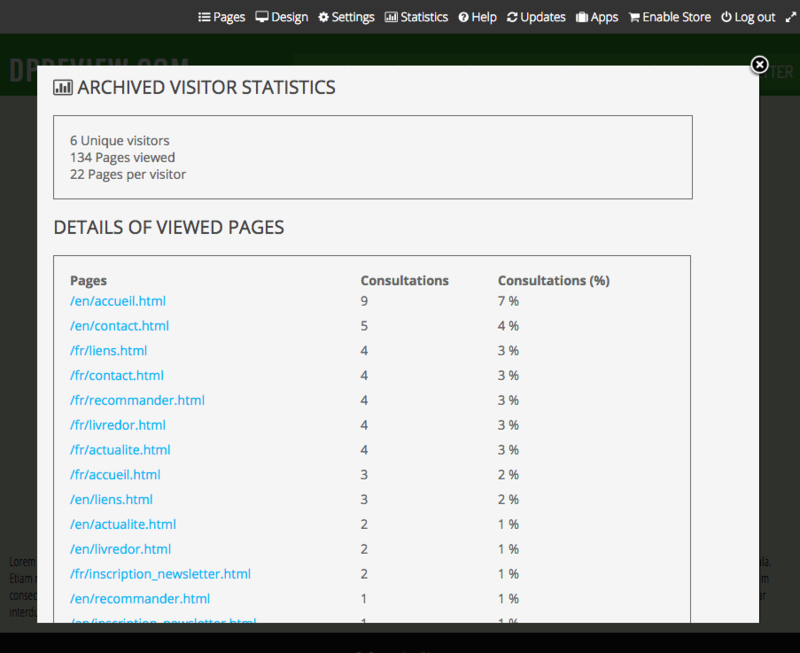 Arguably a website is only as useful as the admin’s ability to monitor its visitor interactions. Photographers.pro includes integrated monitoring tools, primarily a ‘Statistics’ section where both per-month statistics are displayed, as well as total statistics for the life of the website. If those details aren’t enough, however, an option is presented for adding additional ‘modules’, such as Google Analytics. The integrated visitor statistics include a list of pages that have been accessed, the percentage of interactions in relation to the site as a whole, the number of visitors per page, the number of unique visitors, and how many pages are viewed on average per visitor. 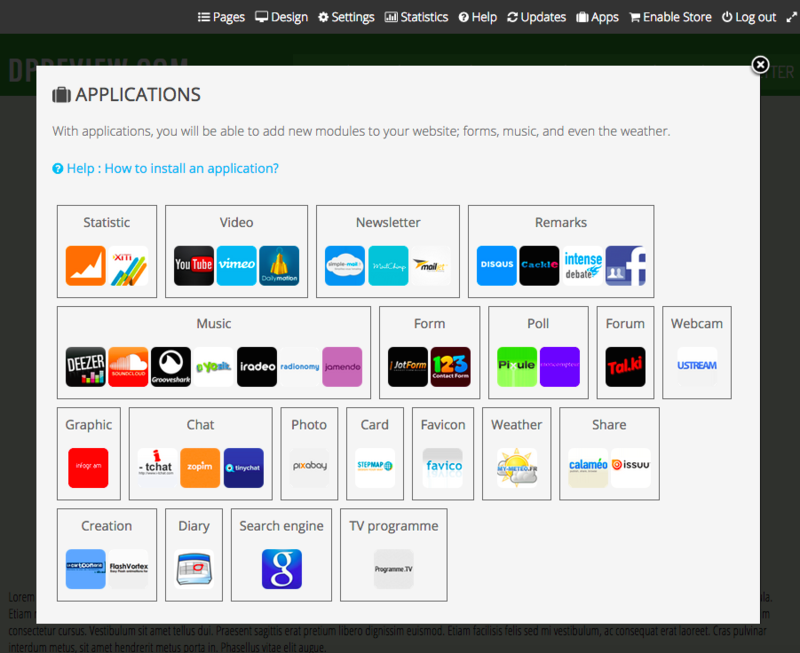 Rounding out the features�is ‘Applications’, which allows users to install third-party apps if desired. There’s Google Search, for example, Ustream, Tiny Chat, Deezer, SoundCloud, and many more. Creating a website doesn’t have to be difficult, but it often is. WordPress tends to be the go-to option for many, but can be�too involved for those with no experience. SquareSpace is another popular option, and there are several photography-centric services, such as Zenfolio, SmugMug, and Photoshelter, which cater to photographers. The $70 annual fee for Photographers.pro�isn’t unreasonable considering all that it includes: a domain address, email address, and unlimited storage, the latter of which is particularly important for those with a lot of photos to store. This is in addition to a simplified management interface coupled with some integrated tools (such as the website statistics feature) and an option for adding in third-party apps. Such features cover most of the bases where you’d otherwise, for example, use plugins or scripts. So what does your $70 annually get you compared to the competition? In comparison, SquareSpace starts at $8/month for a ‘Personal’ account with unlimited storage; Photoshelter’s ‘Standard’ package includes 60GB of storage and nine HTML5 templates, and is priced at $29.99/month; SmugMug charges between $5/month and $35/month, depending on the subscription package, both with unlimited storage; Zenfolio’s unlimited storage plan, meanwhile, costs $60/year. This puts Photographers.pro toward the lower-end of the pricing spectrum, though it is not the cheapest. 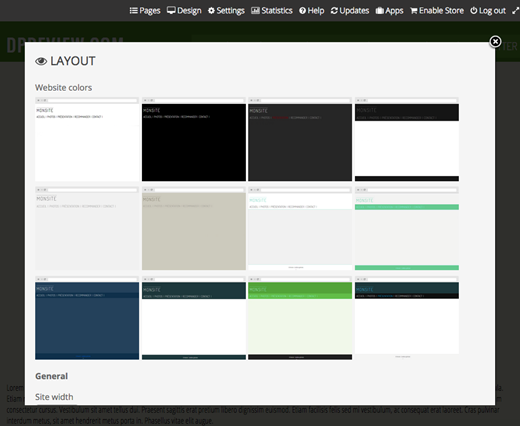 Some might find the lack of substantially different design themes the only problem. In Photoshelter, for example, one is able to select themes that are fairly complete and widely different, and this is likewise true for�Zenfolio, SmugMug, and several other services. The options for website design in Photographers.pro are limited, however.�The different menu orientations and layouts coupled with extensive setting options allow for a high level of customization, but that is not the same as being able to apply new themes that instantly transform the look and functionality of the website. 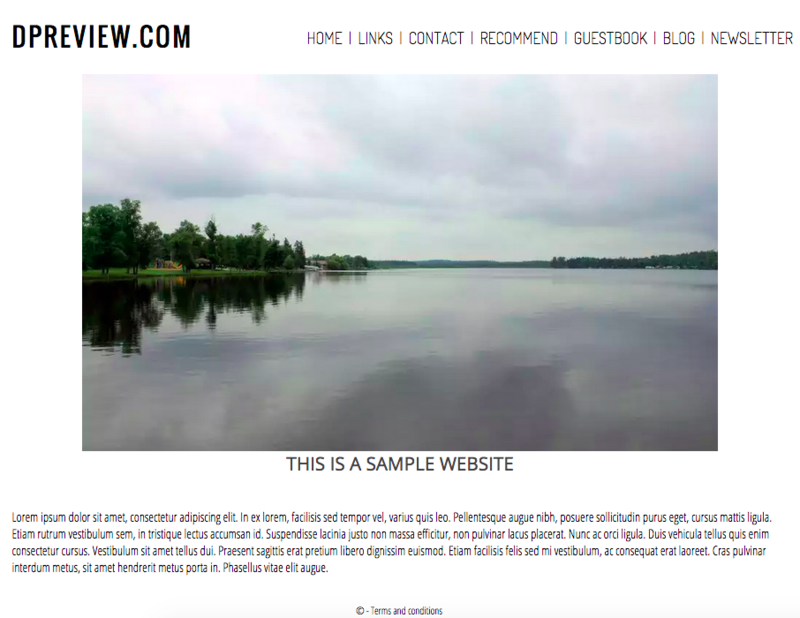 And then there’s SquareSpace,�an option many photographers will consider when setting up a website. 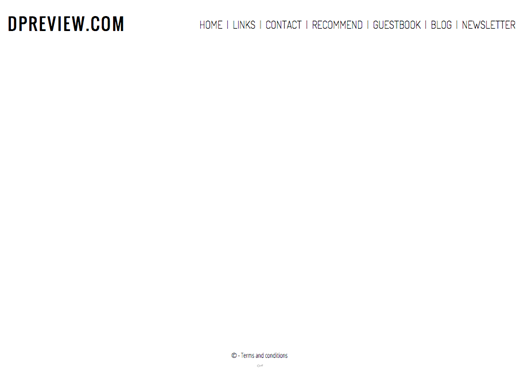 Photographers.pro’s minimalism certainly looks a lot like�SquareSpace. They differ in some notable�ways, though. Photographers.pro doesn’t offer a month-to-month option or a free trial while SquareSpace does. Photographers.pro provides support on weekdays, while SquareSpace offers 24/7 customer support.�Though it’s�aimed at more than just photographers, SquareSpace offers plenty of templates designed with photo portfolios in mind. The combination of Photographers.pro’s simplicity and extensive options means the resulting website can be both unique and meet differing needs among users: one might only want a very basic portfolio website, while another might want a full website with business information, contact forms, and more, and Photographers.pro’s system is able to cater to both. It aims to be a one-stop-shop and delivers on that promise, though without all of the finesse of an established player like SquareSpace. Photographers.pro isn’t a bad option for�photographers who need a website and want the process to be as simple as possible. All of the elements are there for a business website if needed: a custom domain and email address, contact form, third-party apps, Google Analytics, newsletter option, and more. There are enough customization options to make your website your own, as long as you�aren’t looking to go too far outside the box. The yearly price is lower than what you’d typically pay elsewhere�for independent domain registration and a hosting package that includes unlimited storage, though some services like Zenfolio have cheaper options. The limitations on design may be�a�sticking point, but that is only an issue for users expecting a large library of pre-assembled themes.